One of dominant ethnic groups of Nepal, Newar is the indigenous group of Kathmandu valley that used to make almost the entire population of the valley before the Shah invasion in 1968. Before the invasion of the valley, the three cities of Kathmandu, Patan and Bhaktapur were autonomous Newar kingdoms and the latter two cities still have large number of Newar residents. The Newars were primarily farmers and traders as the Kathmandu valley had fertile land suitable for rice cultivation and also trade between India and Tibet. During the Malla regime, the economic condition was stable and strong that gave the people to develop their skills in art, architecture and culture which is why these three cities are rich in cultural and architectural heritage. 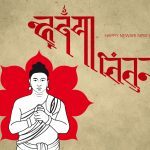 The language used by the Newar is called Nepal Bhasa, commonly known as Newari and has its own script and a rich literature. Although very little is known about the history of development of the Newari culture and society, it is believed that Newars were Buddhist. They were, however, influenced by Hinduism because of its political dominance and many Newars practiced Vajrayana tradition of Buddhism with some having a strong faith in Hinduism and performing Hindu rituals as well. There is also hierarchal division of caste system on the basis of occupation and their social position among the Newars which was started by a Malla king. The highest class is obviously the priestly classes that are Shakya and Bajracharya and the priesthood is handed down to the sons by the fathers. Next on the status are Prashan, Joshi, Rajbhandari, etc. who used to be recruited in government services and worked as the advisors to the King. Then comes the worker class which included the farmers, artisans and craft men and the lowest are on the caste list are the untouchables who are supposed to be the cleaners and butchers. The whole social structure of a Newar community, hence, is built on this caste system. Although the traditional systems are changing in the society, some of the members of Newar community still follow the traditional occupational practices. Newars are found scattered in the various parts of Nepal even though they were originally from the Kathmandu Valley. 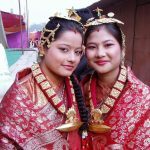 Ihi or Bel Bibaha is one of the first marriages that a Newari girl goes through among the three marriage ceremonies that take place in her life. During this, the little girls who are yet to reach their puberty are married to a Bel (wood-apple) fruit. Then they are married to the sun during their second marriage ceremony that is known as ‘Bara Tayegu’ or ‘Gufa Rakhne’. Their actual marriage takes place when they get into human conjugal relationship. Both the Hindu and Buddhist Newars conducts these ceremonies. Another important festival is the ‘Mha Puja’ (self worship) that takes place during the New Year as per the local calendar i.e. the Nepal Sambat and it usually falls on the month of September or October during the Nepali festival of Tihar. On this day, the people from the Newar community worship themselves. It is also the Newari New Year and the people from Newar community celebrate it with joy and enthusiasm. 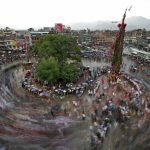 Bisket Jatra is one of the many jatras celebrated by the Newar community which falls on the Nepali New Year in the month of Baisakh. Gunhu Punhi is another important festival of Newar when they drink a bowl of sprouted mixed cereals and offer food to frogs in the farmers’ field. On the second day, Sa Paru (Gai Jatra) is celebrated where the family that has lost its member takes out a procession around the city with one member dressed like a cow or anything comical. This festival was started by a Malla King to console his wife after the death of their young son. The last day of Gunhu Punhi is Krishna Janmastami where the birth of Lord Krishna is celebrated. 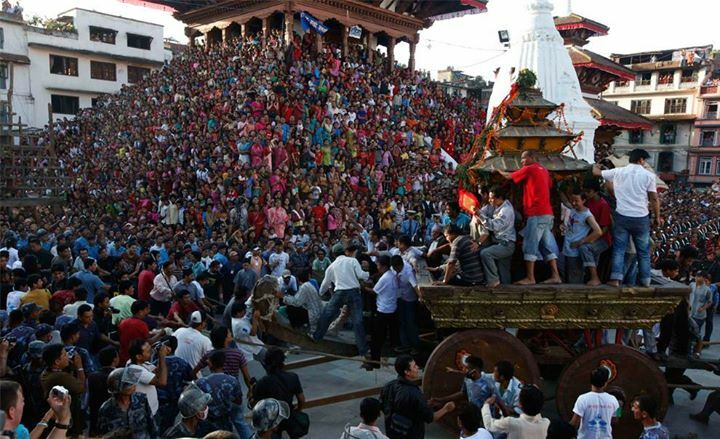 Yanya Punhi (Indra Jatra) is the festival dedicated to Lord Indra, King of heaven. The beginning of the festival is marked by the erection of Yosin, a ceremonial pole and is accompanied by the display of Akash Bhairab’s massive mask spouting beer and liquor, which is a rare display otherwise. Also, the Living Goddess Kumari comes out of her temple in a palanquin leading the procession through the streets of Kathmandu. The Lord is thanked for the rain and dew he provides for the crops during the winter. 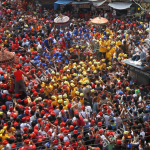 There are many other celebrations related from birth to death celebrated at birth, rice-feeding, childhood, puberty, marriage, seniority and death. There is the Janku celebration for those live long enough to reach their 70s. However, Janku is performed five times in life, first Janku is also known as the rice-feeding ceremony, and the other are performed when the person reach the age of 77 to 106. After performing these rituals, the person will be regarded as god and usually husband and wife perform the rituals together. Newari culture is rich in terms of music as well. The music mainly consists of percussion instruments like madal, etc. along with the wind instruments like flutes and other similar instruments, however, string instruments are quite rare. There are many songs for particular seasons and festivals. The fastest music probably is Paahan chare while the slowest is Dapa, with Dhimay being the loudest music forms. 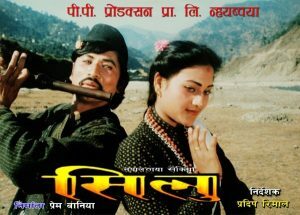 Some instruments like Dhimay and Bhusya are played as instrumentals only, without being accompanied with songs. 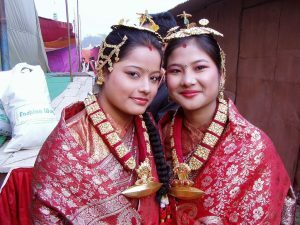 Newari dances are usually of two types that are masked dance and dance without masks. The most famous is the Lakhey dance which is practiced, at least once a year, in almost all the places where there are Newari settlements. 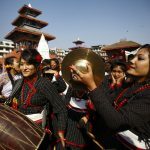 Almost all these dances are held in the month of Goonlaa, which is why it is known as Goonlaa Lakhey but the most famous of all Lakhey dances is the Majipa Lakhey dance which is performed by the Ranjitkars of Kathmandu. It takes place for a week in the week of full moon of during the Yenlaa month. 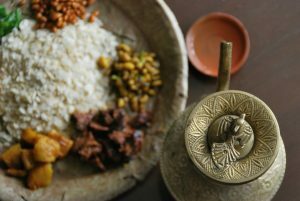 Newari cuisine is rich in terms of serving the traditional food items and almost all the non-veg Newari cuisines consist of he-Buffalo meat, however, it also has some vegetarian cuisines as well. 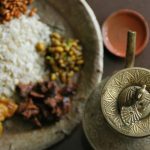 Most of the restaurants and hotels offer typical Newari food and snacks and some of the most popular are Choila, Kachila, Bara, Yomari, Lakhamari, Chatamari, etc. The spices used while preparing the Newari cuisines consist of mainly these items mustard oil, cumin, sesame seeds, turmeric, garlic, ginger, methi, bay leaves, cloves, cinnamon, pepper, chilli, mustard seeds, vinegar, etc. Also, there are special cuisines prepared for particular festivals as well.